There are so many ways to take screenshots in your Google Chrome and Firefox browsers. We would like to share the captured screenshots with our friends or anyone through various sharing methods. There are some good screen capture extensions, software applications, and online services available to use for free. 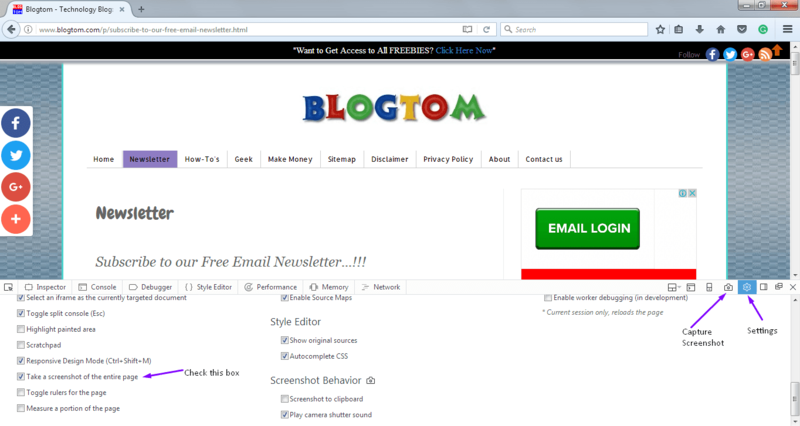 Do you know that the newer version of Google Chrome and Firefox browsers come with inbuilt screen capture feature? I will explain how to utilize this awesome feature for screen capture without the need of any screenshot extension. To get started, open any website. Here, I have demonstrated on my website. After opening any web page, you need to click on 3 dots which is located at the top right corner of the Google Chrome browser. Click on Toggle Device Toolbar. After clicking, the Toggle Device Toolbar icon will turn to blue color. Now click on 3 dots inside the Toggle Device Toolbar. Tap Show Device Frame if you would like to screen capture with a beautiful frame (e.g, iPhone, Android device look). Choose any available device from the drop-down menu. You could even choose edit option to explore more available devices to select. Also, you could customize zoom for the screen capture. I recommend you to fix the zoom to 100%. You could even rotate the screen to capture screenshot in Portrait or Landscape mode. The default mode is portrait. Again click on 3 dots inside the Toggle Device Toolbar. Now it's the time to screen capture chrome. Just tap on Capture Screenshot as shown in the image above. The captured image will be saved in PNG format. Check your downloads section to see the screenshot image. Note: You will get the visible page as the screenshot image. 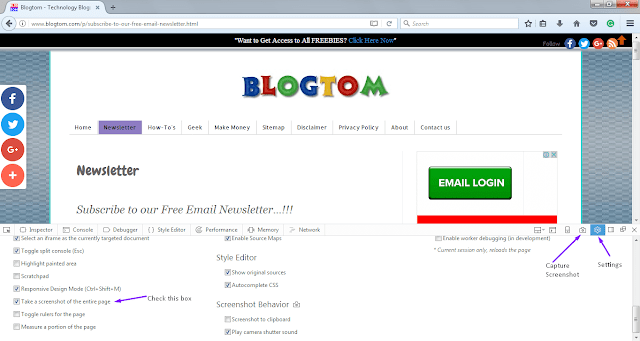 To capture the entire webpage in chrome, you need to use third-party extensions like "Full page screen capture" which you can get it from Chrome Web store. Open any web page. Here also, I used my website page for the demo. Click on Open Menu (3 Horizontal stripes). Now click on Developer > Toggle Tools or alternatively you could press Ctrl + Shift + I as the shortcut key to reach Toggle tools feature. Click on Toolbox options (Settings symbol). Just scroll down and then Check the box named Take a screenshot of the entire page. You will get the option to take a screenshot. A camera icon will appear before the settings symbol. The image will be downloaded in PNG format. To open the image, click the download symbol on your Firefox browser or press Ctrl + J keys. To capture a quick screenshot of the visible page, open any web page. Press Ctrl + PrtScr. The visible page will get copied. Now open Paint on your Windows PC. Save the image as per your preferred format. Search for Snipping Tool and click on it. Move the cursor around the area where you would like to capture a portion as the screenshot. Now click on Save button to save the image to your desired folder. Draw a portion of the area and cut it to save the portion. Window snip and Full-Screen snip. I have explained the possible ways to take a web page screenshot without using any software applications or browser extensions. If you know any other method to capture screen, please mention it in the comments section. So that it will help others too to explore additional methods to screen capture.